Los Angeles City Councilmember David Ryu speaks at an A3PCOM rally in front of the Los Angeles County Hall of Administration. At right is Supervisor Hilda Solis. Twenty Asian Pacific Islander community organizations and members of the Asian Pacific Policy and Planning Council (A3PCON) joined Jan. 25 with Los Angeles County Supervisor Hilda Solis, Los Angeles City Councilmember David Ryu, Los Angeles Unified School District Board President Steve Zimmer and Los Angeles Community College Trustees Mike Eng and Mike Fong to support steps that local elected officials are taking to ensure due process and fairness for undocumented immigrants. The rally was held outside the Los Angeles County Hall of Administration. Speakers said that Los Angeles’ diverse immigrant and refugee communities, including undocumented immigrants, face the increasing peril of their families being torn apart by the anti-immigrant policies of the Trump Administration. “We need and must continue to support our strong and bold elected officials in upholding our values of inclusion, diversity, and equity by protecting all immigrants and refugees, especially those who are in detention and deportation proceedings,” said A3PCON President Debra Fong, adding that her organization remains firmly opposed to presidential actions blocking Muslims from entering the U.S. or re-creating a Muslim registry. Immigration is widely seen as only a Latino issue, although APIs are the fastest-growing immigrant population with the fastest-growing number of undocumented. There are an estimated 130,000 undocumented APIs in Los Angeles County. 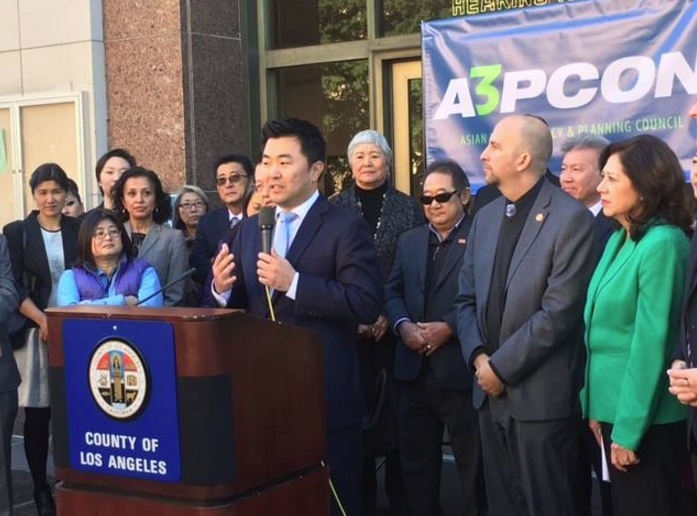 “A3PCON strongly backs the L.A. County supervisors, Mayor [Eric] Garcetti, the L.A. City Council, and local philanthropy in establishing the L.A. Justice Fund to provide $10 million for legal representation in deportation proceedings to ensure due process and fairness for immigrants,” A3PCON Policy Director Mark Masaoka said. The strange sounding rhetoric, mantra-like in its continuity across the range of liberal, group-think voices, continues above; “…blocking Muslims from entering the U.S.”. Umm. Really? “Anti-immigration policies of the Trump administration”. Gee. Pretty broad statement applied to what is actually a very specific executive order I believe (directed at 7 nations I believe… by no means “all Muslim majority nations”, now is it?) And how about this one: “Los Angeles is and will continue to be a place of refuge for people from all walks of life, regardless of one’s background, income, sexual orientation, religious affiliation or even immigration status,” Ryu said in a statement. “. Hmm. “Regardless of one’s… immigration status”? So, by natural logic, Ryu is saying that ‘Los Angeles is, and will continue to be a place of refuge for…” people in the country illegally. Right? Wow.